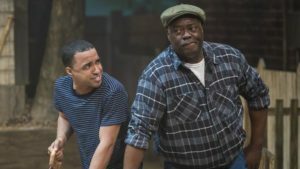 The Cincinnati Shakespeare Company takes on August Wilson’s renowned drama Fences this month, a play which has gotten a lot of attention lately due to the recent acclaimed film version with Denzel Washington and Viola Davis. I had not seen either the film or the play before and was delighted to be introduced to this moving story from a completely fresh perspective. I was certainly not disappointed by CSC’s powerful and riveting production. Crystian Wiltshire and “ranney” in “Fences”. Fences tells the story of a black family in Pittsburgh around 1960, centering on its commanding father, Troy Maxson (played by CSC newcomer “ranney”) , an aging sanitation engineer who has never quite managed to escape the bitterness of an unsuccessful baseball career, as he was too old to enter the major leagues when the color barrier was lifted. He works tirelessly to provide for his wife Rose (Torie Wiggins) and son Cory (Crystian Wiltshire) as well as the occasional grudging handout for his ne’er-do-well son from a previous marriage, Lyons (Darnell Pierre Benjamin) and watching out for his mentally-disabled brother, Gabriel (Geoffrey Warren Barnes II). Tension mounts, however, as Troy finds the demands of family responsibility become overwhelming, especially when he cannot reconcile himself with Cory’s dreams of pursuing a football scholarship, whether out of his own envy or his fears of Cory’s disappointment. The backyard and facade of the Maxsons’ home — the play’s single location — is painstakingly recreated on the CSC stage by scenic designer Shannon Moore, down to the dirt yard which brings up puffs of dust when the actors stamp on it. The play is very long, almost two and a half hours, especially noteworthy given a limited cast and single location, but credit director Christopher V. Edwards for not trying to rush it. The play lovingly lingers on every languid tune sung by Troy and every detailed reminiscence. This may make for a slow unraveling of the plot sometimes, but it is worth it as it immerses you in Troy’s character and the Maxsons’ world. As a result, the performances are crucial for maintaining the audience’s attention, and this ensemble is unfailingly authentic and compelling. “ranney” embodies Troy empathetically as both strong but somehow vulnerable, and he dominates the stage. Wiggins masterfully portrays Rose as both barely restrained but passionate when necessary. Wiltshire and Benjamin avoid stereotyping Troy’s contrasting sons, while Barnes manages to bring Gabriel to life with respect and avoiding pathos. The cast is rounded out by Sylvester Little, Jr., as Troy’s earnest friend, Jim Bono, and the young Morgan Olivia Reynolds who brightens up the final scenes of the play. Fences certainly encompasses many of the specific challenges faced by the black community in the 60’s as well as today — racism, poverty, and maintaining family cohesiveness — but I was very impressed with how universal and timeless many of its themes were. Perhaps I am overreaching, but for me Troy (notwithstanding his name) achieved an almost Odyssean status: larger than life, telling epic stories of his baseball exploits and confronting Death and the Devil, and facing the difficulty of reconciling himself to family life and passing on his mantle to his son. In the end, despite his flaws, he is redeemed as we all hope to be. Fences is a thought-provoking and relevant drama for all audiences. Fences runs at the Otto M. Budig theatre January 25th — February 16th. 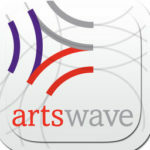 Tickets are available at the Cincinnati Shakespeare Company website, www.cincyshakes.com. This was written by Sheldon Polonsky. Posted on Sunday, January 27, 2019, at 10:47 pm. Filed under Stage Insights News, Stage Insights Reviews. Bookmark the permalink. Follow comments here with the RSS feed. Comments are closed, but you can leave a trackback.